The history of the society already started before its actual formal foundation. The first EMS Newsletter was published in 1996 and contained short profiles, reports on current activities and contact addresses of national meteorological societies in Europe. Then, as today, the purpose of such a network was to communicate, inform and co-ordinate activities of the national societies in order to strengthen their potentials. A paper by René Morin and Jon Wieringa recording the history of founding the EMS has been published in two parts in Weather. The paper is entitled “Associating weather societies across Europe”. Formally the founding process was completed in 1999 in Norrköping, Sweden, during the European Conference on Applications of Meteorology. 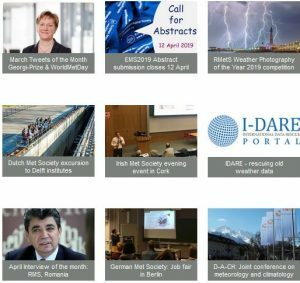 The first EMS Annual Meeting was held in 2001, during the 5th European Conference on Applications of Meteorology in Budapest, organised as a lecture and round table discussion on the Future of Meteorology. From 2004 the format of the EMS Annual Meeting was developed as a conference with a public call for contributions. Also the spectrum of themes covered in the meetings has expanded. Partnership with the European Conference on Applications of Meteorology (ECAM) has continued in the form of joint organisation of both these meetings biennially. In addition the European Conference on Applied Climatology (ECAC) under the auspices of ECSN of EUMETNET, now the EUMETNET Climate Programme, became a partner in the organisation of the conference in alternate years. The EMS Annual Meeting, as the main focus of activity since its birth, has been moving round Europe – Hungary, Belgium, Romania, Italy, France, The Netherlands, Slovenia, Spain, Switzerland, Germany, Poland, the UK, the Czech Republic, Bulgaria, Italy and the most recent in Ireland in 2017. Advancement of science, practice and application of meteorology at a Europe-wide level. Promotion of public understanding of meteorology. Support of member societies to benefit all classes of their individual members in both the applied and research fields. Promotion of the exchange of ideas and information between individual members. Interaction with other relevant bodies. Promotion of the discussion designed to ensure that meteorology makes its maximum contribution to human and economic welfare. Ensuring that national and international activity concerned with climate change is motivated by the best possible meteorological advice. by J. Wieringa: Teaching natural science at primary schools – politically not important or educationally too difficult ?